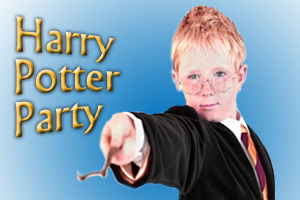 INVITATIONS: For the invites, I typed up the EXACT letter that Harry gets on parchment paper. Then I traced over the letters in green ink so it looked like the writing from the book. My daughter has a HP stationary kit with Hedwig on the front, so I copied that on to my printer, cut out the owl, and attached that to the letter.We then melted a red crayon to seal the letter and stamped an H into the wax. DECORATIONS: For the decorations I have sheet that I painted to look like grey bricks from my husbands birthday and I hung that on all the main walls in the house and in the downstairs bedroom. (to look like a dungeon) I also put up some of our Halloween decorations and even blew up the huge black spider from a Halloween raffle. For the Great Hall I put two long wooden tables that I got off Craigs List in the center of the dining room and hung gold garland all over the room. I had also ordered some plastic gold platters and goblets from Birthday Express for the utensils and table decor. In the back yard I set up a baby pool and put black bath tints in the water for the black lake. We have two sheds in our backyard so I decorated one to look like the shrieking shack with some Halloween stuff, and the other to look like Hagrid's hut with dragon toys and stuffed animals. On the porch we had signs that pointed in one direction that said stuff like Hogsmeade this Way. COSTUMES: For the costumes my husband dressed up as Dumbldore by using a navy blue wizards robe, a long beard, and a long white wig. He also had an old wand that my daughter got from a wand book. I was professor McGonagall and dressed in an emerald green robe and a black witches hat. My daughter was Luna Lovegood and dressed in a black school robe and wore some weird glasses. ( like spectres specs) My friends husband was Hagrid and wore an old brown sheet, big boots, a brown wig and beard, and carried my daughters pink flower umbrella. For the owl emporium I had some of my daughters friends come over before hand and make little owls out of pine cones white boa pipe cleaners craft feathers and googly eyes. All you have to do is wrap the boa around the pine cone and attach craft feathers and eyes and bend the pipe cleaner to make a beak. I had also wrapped blue wrapping paper around boxes of yogurt raisins and wrote Owl Food in sharpie. The Apothecary was a bit harder. I had all my friends and my daughters friends go into the back yard and pick all kinds of plants and wrap them in a leaf pouch. Then I wrote stuff like Troll Bones on the packets. For Ollivanders I had my brother dress as Ollivander and I made wands out of wooden dowels double sided tape craft foam and glitter. First I stuck the tape to the end of the dowel and wrapped the foam around it. Then I sprayed on some spray on glue and quickly dipped the wand in gold sparkles. They were AMAZING. Weaslys Wizard Wheezes I bought a ton of joke shop items like kooky goggles and inflatable tongues and boxing telescopes. I also bought Zots candy and said it was a new rabies Skiving Snack Box. At Honeydukes there were Bertie Botts Beans droobles bubble gum and chocolate frogs with wizard cards. ( printed off online) My dad dressed up as a goblin and wore a goblin face mask from a theatre store and a green cape from halloween. I made little quill pens to pick up at Gringotts and I collected a bunch of fake gold from my mom's marti gras trips. I also had a little tissue box at each station to collect the money owed for each item. After Diagon Alley the kids had a quick snack at The Leaky Caldron which consisted of butterbeer (ginger ale and butterscotch syrup) and chocolate frogs. After snack Hagrid took them upstairs to the Great Hall where I had placed a stool and a brown wizards hat which I cut holes in to look like the Sorting Hat. The stool was right next to the guest bedroom where my husband was inside speaking into a little toy mic that my daughter had. As each girl was sorted I pinned their house crest to their robe. PARTY SNACKS: Next came the feast which consisted of turkey butterbeer grapes and roast beef. After the feast I had organized classes. GAMES: There was Divination Charms Defense against the dark arts potions transfiguration herbology and care of magical creatures. Divination was in my daughters room with only a couple of dim lights incense and poofs. I had them shake a magic 8 ball to see their fortune and I had my mom teach them palmistry and make up some silly fortunes to tell them. In charms I had the girls say Wingardium Leviosa to a feather and my husband would stand at the top of the stairs and pull a string attached to the feather to make it lift up. Defense Against the Dark Arts was in the basement and all the girls would try to steal the chocolate out of a basket before the Dementor (aka my dad) tagged them. You could revive a frozen girl by giving them chocolate. This was a lot of fun for all of the girls. In potions the girls tried out the potions from their booklet with some random potion ingredients that I labeled from HP. A lot of them exploded and the girls had so much fun! In transfiguration we played a charades game and the others tried to guess what HP character the charade person was. Before calling out the girls had to say a spell and point their wand at the charade person. In herbology I cut up pantyhose and had the girls fill them with dragon dung fertilizer. Then they took rubber bands and made mandrake legs arms and heads.I filled each head with Chia seeds and put them in pots for the girls to take home. If they grew right they would have sprout hair. The last class was Care of Magical Creatures. It was in Hagrids Hut and I had bought some of those little magic worms that you drag through your fingers. I gave one to each girl and called them Nifflers. They all thought the Nifflers were so cute! At the end of the party the girls went to their house common rooms. The Hufflepuff's common room was in a guest bedroom near the kitchen and you have to say a password to a toy badger for the door to open( it was really just my dad) The Ravenclaw common room was in my daughters room (because she's a Ravenclaw) and you have to answer a HP trivia question to enter. The Gryfindor common room was in our downstairs family room and you have to say the password to the portrait of the Fat Lady (my mom) to enter. The Slytherin common room was out in the garage and to enter you have to knock over a wall made of toy bricks. CAKE: For the cake I made a huge golden snitch and attached sugared ice cream cones for wings. I also stuck a HP cake topper on top. FAVORS: For the favors I didn't hand out to much because they already had so much stuff. I gave them quidditch jerseys which I tie dyed with their house colors and a little golden snitch. They also got a little bottle of phenix tears. (fruit juice). While we waited for the parents to show up we played a little quidditch. we did it on the driveway outside and had three beaters carrying squishy balls their job was to hit an opposing team member to make them freeze for 10 seconds. There were three chasers on each team who carried a basketball and passed it to each other and tried to shoot it into three hula hoops at the end of the driveway on both sides. If they did they scored 10 points. There was one keeper on each team who had a broom to defend the hoops. Then there was one seeker to a team. All the parents passed a little stuffed snitch around the driveway and the seeker had a lacrosse stick to catch the snitch in. Whoever caught it first won. We did team photos and then all the kids watched a little of the first HP movie. After that the kids went home and it was about 9:00 pm!!! I was exhausted after that but it was TOTALLY worth it!"